We carry out all types of commercial cleaning, whether it is a high street shop, restaurant, pub - right up to a multi national tower block. We specialise in property developments and work with our clients to provide a tailor-made package suitable for that individual's needs. Whether you need a general clean-up, removal of cobwebs, or disaster, this can be carried out by our team of fully trained operatives. Various contracts are available, be it daily, weekly or monthly. 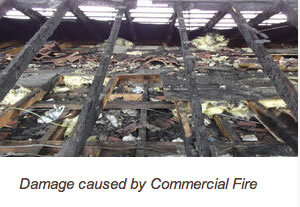 Any commercial work is subject to an on-site survey and written quotation. We are fully experienced in handling emergency situations and can be on-site to assess the damage usually within 3-4 hours of your call. Whether the damage is to a shop premises, restaurant, theatre, residential homes - we aim to have you back in business as soon as possible. Our team are trained to provide help and support, which always starts with a fully extensive operation. 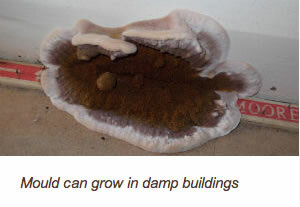 Where flooding is concerned, you can end up with quite significant mould growth if not treated quickly (as shown below). 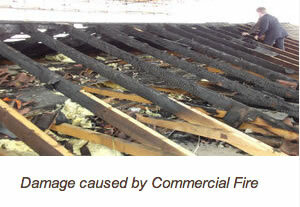 For further information on disaster restoration please do not hesitate to contact us on our freephone line 0800 085 0313. Don’t Panic – We are here to help!! It is the course of life that accidents will and can happen but these can be resolved. Maybe you do not need the help of a professional but we are here to assist our customers whatever the circumstances. Should you have the misfortune of a spillage on to your carpet, quick action is require to prevent the stain from setting. Don’t over-wet the backing of materials and test any solution on a small area of carpet prior to treating the whole stain. Only use detergents at the recommend levels of dilution. Scrape/blot excess prior to treating the stain. Never rub, scrub and use inappropriate detergents on carpets/upholstery. A favourite used by our customers is washing up liquid (which foams and is very hard to extract!). Also washing powders, bleach etc. Only work from the outside of the stain inwards so the stain does not spread. Only apply the cleaning fluid to the cleaning cloth and not directly to the carpet or upholstery. Deal with the stain as quickly as possible to avoid this becoming permanent. Blot the surplus spill and apply a detergency vinegar solution, little by little and work from the outer edge of the stain inwards. Blot with dry clothes and rinse. Should you require technical assistance/advice before doing this please call us and we will be happy to guide you through the process. Our quick stain removal guide is quite straight forward and will help in preventing some common disasters often encountered by the customer taking the challenge on themselves without knowing the correct procedures. Unfortunately, there is never any guarantee that the stain will be completely removed but it will make our life easier, if we need to tackle the stain, the best chance of success in removing the stain completely.